Updates and commentary as the Red Sox take on the New York Yankees on Sunday, April 13. A.J. Pierzynski on Felix Doubront: "When he throws the ball over the plate, he’s as good as anybody." David Ortiz on Ichiro's catch: "That ninja m-----------." 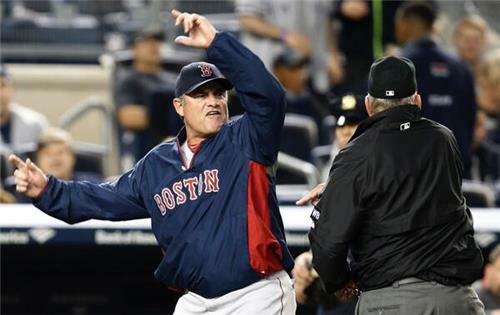 Can’t say I’ve ever seen John Farrell quite that mad before. Fair to say he’s not a proponent of the replay system. Farrell: "Any angle that we looked at, you couldn't tell if the foot was on the bag behind Mike Napoli's leg." JF: "We were instructed that when the ball enters the glove, not that it has to hit the back of the glove, is where the out is complete." Doe he get fined for that?
. @RedSox_Thoughts Farrell said he has been told it matters when the ball "enters the glove," not "hits the back of it." John Farrell: "It was clear the replay was inconclusive. ... It's extremely difficult to have any faith in the system." Farrell: "We felt it was clear that the replay was inconclusive... On the heels of yesterday it's hard to have any faith in the system." FINAL: Yankees 3, #RedSox 2. Did enough happen in that game? Very entertaining.